I did try and upload in the official video but for some reason Blogger wouldn't let me!!! So this will have to do! I just love the drums on this track!! 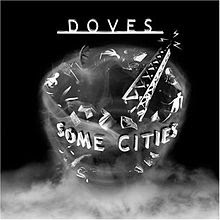 Black and White Town was the lead single on Doves' third album, Some Cities. The single was released as a promo CD on December 13, 2004, and as a full single on February 7, 2005. The song scored the band their second Top 10 hit, charting at #6 on the UK Singles Chart. The atmospheric single is noted for its heavy piano and guitars played in unison, with Andy Williams' percussion maintaining a driving beat. The song was used prominently by the BBC during their coverage of the 2005 Six Nations rugby tournament. Not only was it used in the 2005 Six Nations championships, but it is still used in the BBC's coverage of all international rugby. It is also used for Sky's coverage of the UEFA Champions League, as well as being used in the video game FIFA 06, where it was mis-credited as Stars of CCTV by Hard-Fi, however this is not true on the psp version of the game. It was also used in some trailers for the BBC sitcom Gavin and Stacey. This is one of those songs that only needs one listen for you to remember it forever.